Folks rotating in and out of 904 Palmer Alley in Northwest are buzzing — and it’s not just with excitement over the newest storefront to open at City Center DC. They’re getting a taste of the latest caffeinated craze to hit the District: nitro coffee. Behind the counter at Dolcezza, owner Robb Duncan pours what looks like Guinness out of a shiny silver tap and advises customers to pace themselves as they take their first sip of the cold, frothy drink. 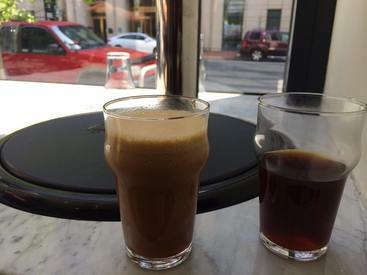 “I’m always very skeptical about anything when anybody has something new that comes along … but [nitro coffee] is fascinating,” says Duncan, who opened his seventh D.C.-area Dolcezza location last week.